Here comes the bride…all dressed in…pink. I had to take a leave of absence from blogging. I found I couldn’t plan and execute a wedding, work a forty-hour a week graphic design job, sneak in some freelance and blog. But….I. Am. Back. 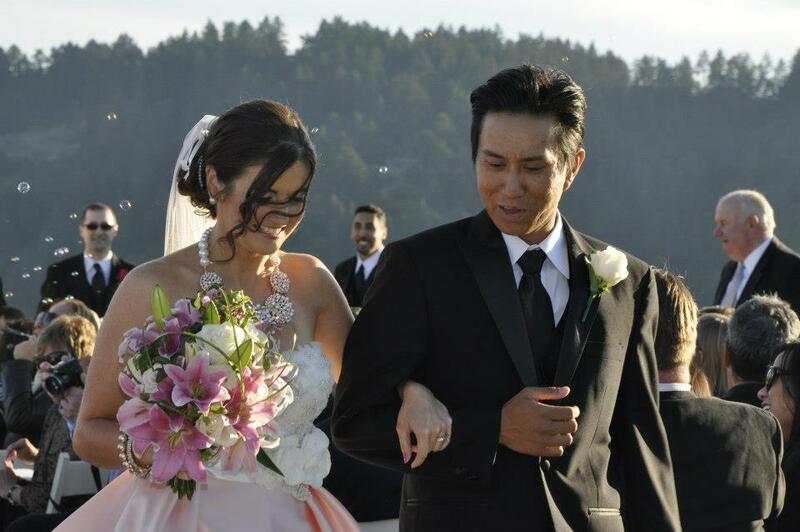 And to kick off my return, I decided to bring you all the glamour, fun and lusciousness of my wedding. I’ll get into all the details but I figured first and foremost we should talk about the dress. I started looking for my dress before I even found my venue. I knew I wanted to feel like a princess and I knew I wanted to be somewhat traditional but also was drawn to something in blush or pink. In short, I had a definite vision. I’m quite petite and my new husband/then fiancé is around 5’6”, strong but wiry…just like I like ‘em. I was drawn to the ball gown style but did not want something that would overwhelm my small stature or make it impossible to get close to my love. Ever since princess Diana walked down the aisle with her mile-long train I have dreamed of a train of my own. My mom took a vacation and flew in to help me find my dream dress. Four bridal shops later, I hadn’t found anything that I liked that was also in my budget. 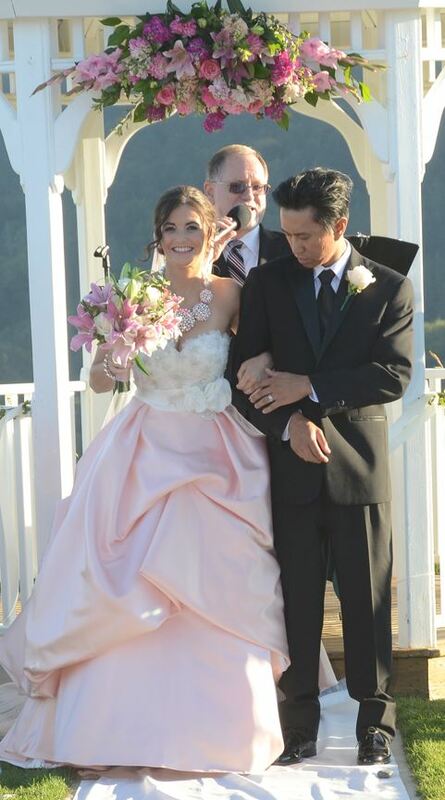 I had twirled around in a gorgeous Monique Lhuillier that turned out to be the blush pink version of the one Vanessa Lachey wore when she married Nick Lachey. It was perfect but about $2000 beyond my budget before we even got to the fitting costs. So what was a bride to do? With that dress in the back of my mind I started looking for something similar. That dress was actually made up of a bustier and a full skirt. I liked the versatility and options that created. I combed all the online sites, searched everywhere. At the very moment, I was about to pull my hair out and give up, I stumbled on the Watters website. And lo and behold, under their Wtoo line was the doppelganger of the Monique Lhuillier dress…but in white. I still wanted pink. I was determined. I noticed some of their dresses came in a blush color. I contacted Watters and they said I could work with one of their retailers on getting the dress in pink. I found a store in Burlingame, CA close to my apartment that carried the brand and had the dress I could try on. I put on the dress and it was The One. I talked to the owner of the store about getting it in pink. She contacted Watters and couldn’t find who had given me the go ahead to make my dream dress in pink. Now what? I had my heart set on this dress in pink. 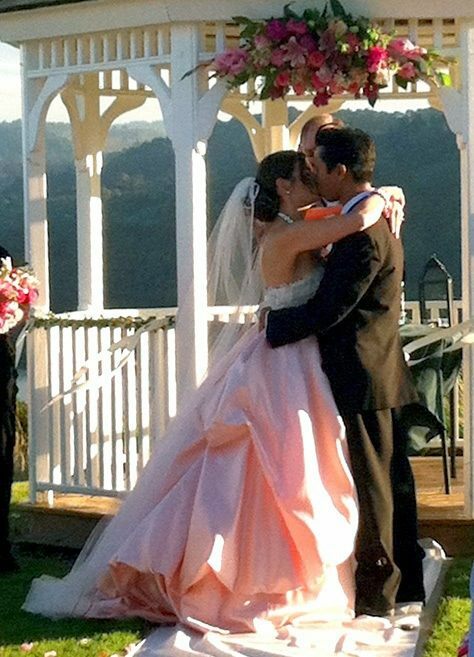 This was my wedding and I didn’t want to compromise on something so special that you only get to do once. Luckily I had started shopping way ahead and she offered to order me the bustier and custom make me the skirt in the color of my choice. Several back and forth color options later, I had chosen a pink that made me swoon. I waited anxiously to see the finished product. And waited. And waited. I started to get nervous. My wedding was only two months away and I hadn’t seen my dress, let alone tried in on again or had the fitting. My mom got involved by calling and prompting the proprietor. Finally, they called me and I was able to go in for the fitting. Photo from the fitting below. Feeling pretty in pink at my fiting. It took my breath away. The seamstress was an artist. I was so excited. Unfortunately the bill took my mom’s breath away too. Ahem, permit me to give you a tip. We had set down a budget, we had made the proprietor aware of our budget, we had been assured of staying within the budget and we had trusted that our needs would be met. The budget was blown by more than a little but when you’re already standing in the dream dress, that’s been custom made for you, there isn’t a whole lot you can do. I would strongly advise, calling often and requesting updates and being appraised all along the way on what’s going on, how much the various options will cost, and your options in general. That aside I had my dream dress to marry my dream guy. And in the end…that’s the thing isn’t it? I hope everyone feels like I did on my wedding day. I felt surrounded by love, surrounded by support and generosity. My wedding went above and beyond my wildest expectations. I truly can’t remember ever being happier or more in the moment. I just soaked it all in. 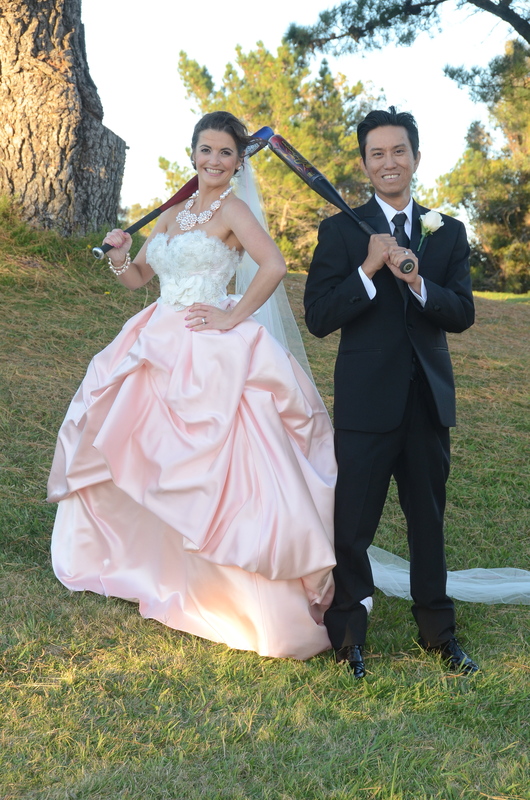 I can’t wait to share all the little details that made it all possible…including a second dress for the reception. Stay tuned for more wedding loveliness. I’ll cover everything from bridesmaids, to flower girls, to tuxes, to flowers, catering and more! In my next post, I’ll put a link to all the various venders and services I used to pull off this wedding. Hopefully, it will help future brides and mothers of brides. All photos by Royce Fordyce with the exception of the kiss by David Miller and the third photo by my groom’s aunt, Nora Johnson. If you have any comments or questions, I’d love to hear them. We met on the softball field and now we are teammates for life.